You’ll hear from business owners, remote workers and freelancers who make a living while following their passions! 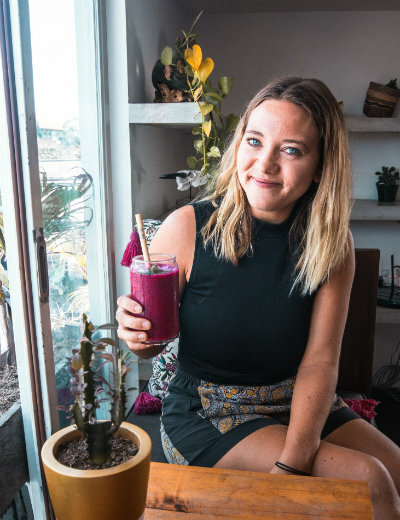 Harri Simonis runs Bare Vida, an eco-friendly brand which she set up after falling in love with surfing in Bali and wanting to reduce the plastic pollution in the sea. When she’s not working in a cafe, you can find her on (or under) a surfboard. I’m from the UK, and after working in an ad agency in London for 5 years, I quit to go travelling. While I was away, I started freelancing a bit remotely while setting up my own travel blog so that I could start learning the skills to work for myself. It gave me more time to work out what I actually wanted to do. And the more I read about the issue, the worse I realized it is. It’s been predicted that (if we don’t change our behaviour), there will be more plastic in our oceans than fish by 2050! 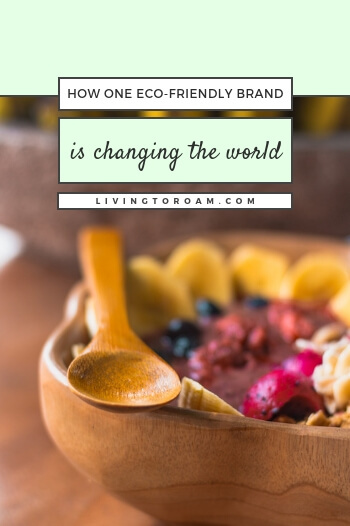 So that’s why I decided to launch Bare Vida; an eco-friendly brand, selling reusable things to help people cut down on their use of plastic in their everyday life. Talk us through how your amazing brand, Bare Vida first came to life. I always knew I wanted to work for myself but I never thought it was within reach. I had always assumed it would be too difficult. Then when I was travelling, I met lots of people who were all running their own businesses – and I thought if they can do it, why can’t I! 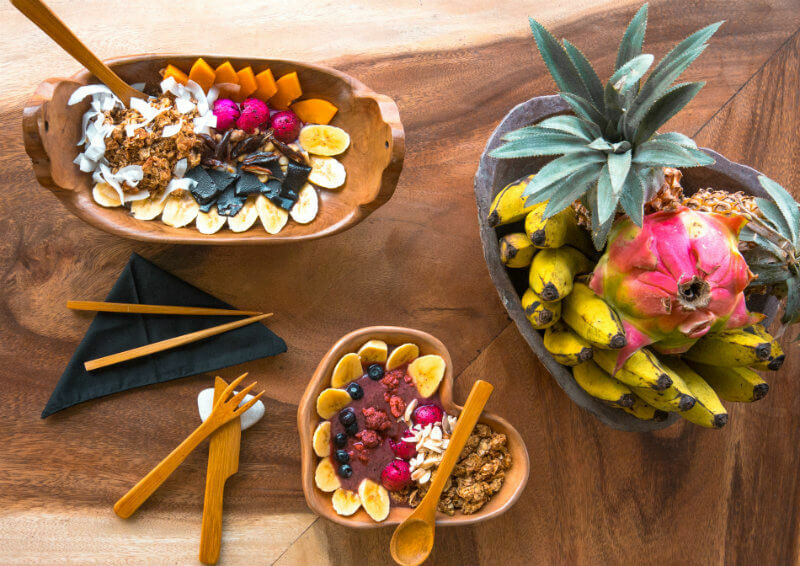 The idea for Bare Vida was born when I was having a coconut after a surf in Bali, and I was drinking with a bamboo straw. 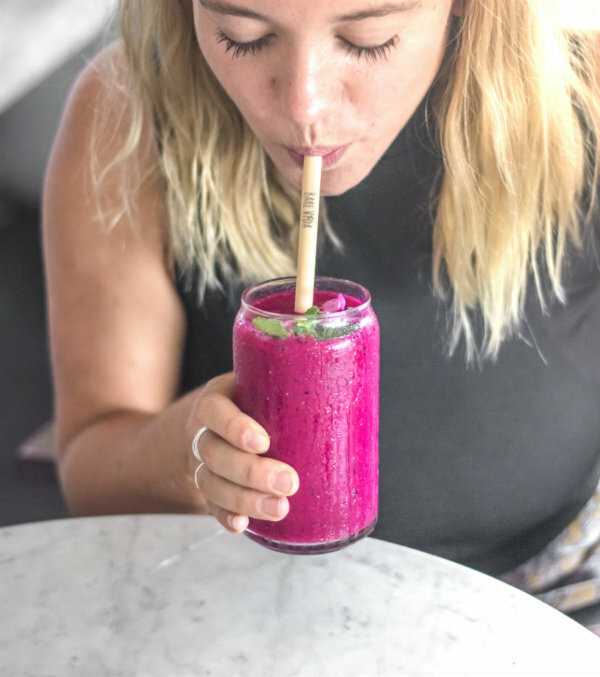 I thought: “This is pretty cool” – much better for our environment than plastic straws, and better than paper straws which go soggy in minutes. It then made me think about the whole cutlery set. 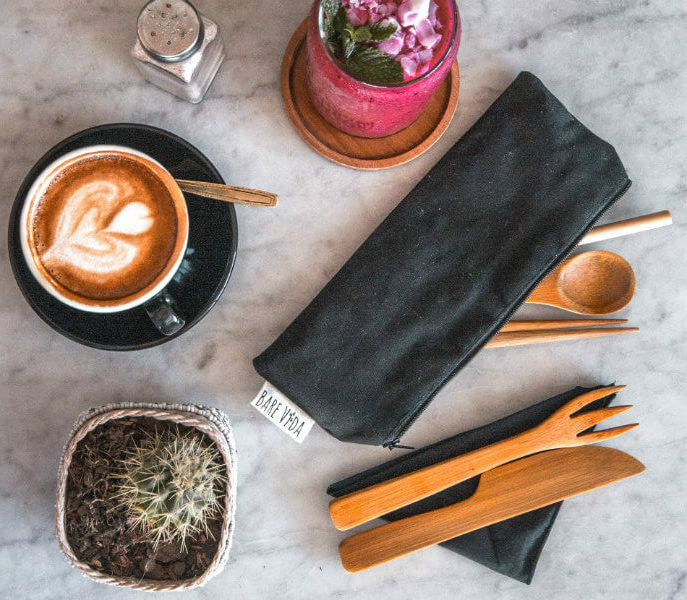 In London, single-use plastics are EVERYWHERE, in so many cafes and shops. So I went looking for bamboo producers in Bali, and found someone who could help me make some bamboo cutlery sets. I started with just a small order of 100 units. They sold out almost instantly and I’ve grown the business from there. Is running Bare Vida everything you thought it would be when you first started? I didn’t really have any ideas about what it would be like. I think it’s easy to over-think things before you start, which can get you into a bit of a pickle. I tried to just go for it & see what happens. What has been your biggest challenge in starting a brand centered around sustainability? Focusing on sustainability while competing on price has definitely been the hardest thing. Since I launched, I’ve had a ton of competitors also launch on Amazon – selling similar products for half price, but made in China. 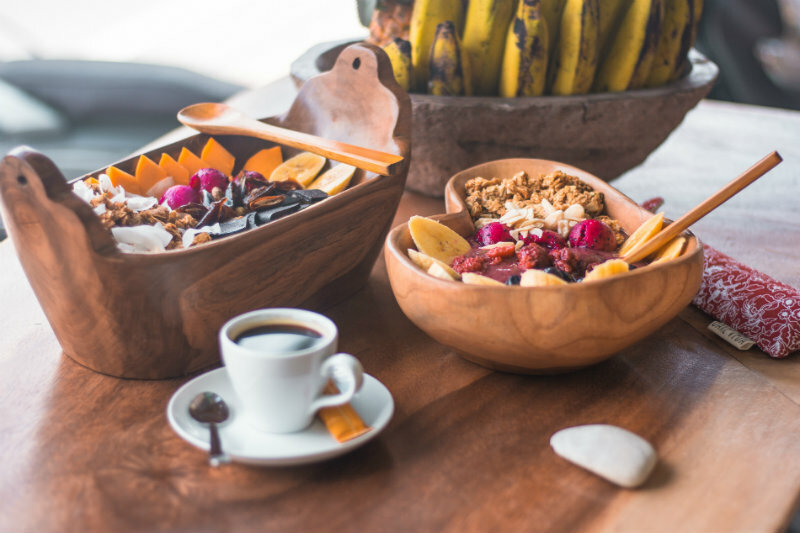 You can tell the quality isn’t as good; they don’t handmake each item and they don’t use food-approved varnish which is super important to protect the bamboo. It seems that these companies are all mass-producing, which of course is going to be cheaper than doing things by hand. I could have sourced my bamboo cutlery from China too but there’s no way to tell if the factory is burning through energy or treating their workers fairly. I want to support the local communities where I live, and am a big believer in making these reusable items as ethically as possible. To me, it’s hypocritical to create an eco-friendly brand creating products using producerswho potentially overuse energy and mistreat their workers. I believe my product is high quality and that the people who want to buy ethical products will hopefully be happy to pay a little bit more for something that is made ethically too. Not to listen to everyone! When I first started out, I was super excited to learn and went to as many talks as possible, Googled a LOT, and spoke to heaps of people too. However I became pretty overwhelmed at all the conflicting opinions, had a to-do list about a mile long, and found myself stuck with what direction to go in. Then, a friend told me to follow my intuition, listen to a select few people, and ignore everyone else. It’s helped me channel my direction, and focus on nailing a few things. It’s all about doing a few things really well rather than spreading myself too thin and trying everything half-heartedly. Doing what you do, means you must be a productivity machine. Could you share with us one of your best tips for staying motivated and getting sh*t done? Waking up early is key. I never used to be a morning person so it’s taken me a while to train myself to get better in this respect, but now I wake up at 6am. It means I can get a few hours of work done in the morning which helps start the day well. • I always use Trello to manage my to-do lists. It’s easy to move tasks from ‘to do’ to ‘done’ which is always a great feeling! • Making sure there’s enough time to exercise and let off steam helps me work better. • I try to read every single day, even if it’s just half an hour, as it helps me learn from the best! I’m reading Never Split The Difference: Negotiating As If Your Life Depended On It which is from the perspective of an ex-FBI hostage negotiator (Chris Voss) and how you can get the best business outcomes from negotiating in similar ways! How I Built This is my favourite podcast – with interviews of the founders of Airbnb, Reddit and Instagram. Is there anyone in the eCommerce space that you look up to or who has helped you get to where you are today? Tim Ferriss’ 4-Hour Work Week was the first book that opened my eyes to the world of remote working. It kickstarted the desire to leave my corporate job and realise that working for myself was within reach. Erin Young (the owner of Zen Green Tea) is amazing too. I met her while I was in Medellin and I started working for Zen while she mentored me. Helping me learn all about how to run a business online. After working for 5 years in an office job in London, the only necessity for me right now is to have the freedom and flexibility to work where and when I want. The ironic thing is that I still spend a lot of my time working, but I’d much rather work from the beach, cafe, or even at home – rather than in the same office every day. I still need to be in Bali at certain times to manage the production and shipping of my stock, but I’m already looking for ways to allow myself to run it remotely. What were some of the first steps you took toward achieving this lifestyle for yourself? Moving to Medellin in Colombia was the game changer for me. I originally went there to learn Spanish, but when I was there, I met so many digital nomads and entrepreneurs there. Before I met them, I didn’t have the confidence to start working remotely as I didn’t think I had any transferable skills. They made me realise that working remotely, and starting a business, is totally possible. Canggu in Bali & Medellin in Colombia have been my two favourite cities to live and work. They are both hubs for remote workers which means that there are heaps of other people doing similar things, and so many inspirational people there. I love being around people who have all quit their jobs back home and are hustling for themselves. It’s infectious and so great to learn from everyone! I wake up around 6am and usually do 2 hours of work before I go for a surf. Then I’ll head to a cafe to grab some lunch and do a few more hours of work. I usually have another break when I go to the gym or do some yoga, will cook some dinner in my villa, and then read a bit before bed. It’s hard to switch off. Being able to work from wherever, whenever means that emails can reach you all the time – whether it’s the weekend or middle of the night. I like to reply as soon as I can, although I think I need to give myself more time off or I might go crazy soon! I love having the freedom to work from wherever I want. For example, if I want a change of scenery, I’ll pack a small bag with my laptop and can be just as productive from anywhere else. Finally, if your business journey was a Hollywood movie, what genre would it be, and who would you want playing yourself and why? I used to be called ‘H Bomb’ at my job in London because I used to attack all my projects and never let things stop me. So it would probably be an action movie, played by someone like Angelina Jolie as she’s strong and determined! Have any questions about Harri’s journey as a sustainable eCommerce business owner? Pop them in the comments below!